Tuesday, 9 February 2016, 5:45 – 7:15 p.m. Doors open at 5:45, introduction and announcements at 6:00, followed by the lecture. Please RSVP by replying to this email, or direct mailing sweet.lecture@tacny.org. Thank you. 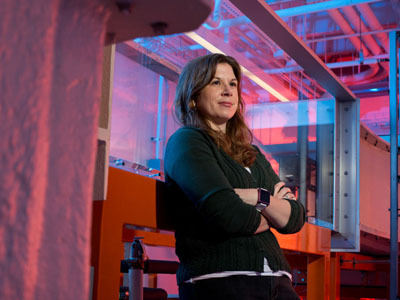 Professor Melissa Green’s research interests include vortex-dominated wakes generated by swimming offlying of animals and the coherent structure composition of reacting and non-reacting turbulent flow fields. Increased understanding of how these flows are organized can lead to advances in basic research, model development for flow simulation, dynamics and control plus improvements in existing technology. In order to investigate these flows, Dr. Green integrates quantitative and qualitative experimental techniques with comprehensive data analysis such as Lagrangian coherent structures identification. Green earned her Ph.D. in Mechanical and Aerospace Engineering from Princeton University, and her BS in Aerospace Engineering from the University of Notre Dame. Prior to joining the faculty of Syracuse University in 2012, Professor Green was an NRC Postdoctoral Research Associate at the US Naval Research Laboratory. In 2014, she was the recipient of the US Air Force Office of Scientific Research Young Investigator Award.